Noticing higher energy or water bills this summer? You may have if you’ve been cranking the AC or watering your garden more to combat the extreme heat. And, you’re right to take action. 2018 is on pace to be the hottest year on record. Instead of reacting, though, approach the dry spells and heat proactively. Pick drought-tolerant trees but remember, wait until fall to plant new trees! 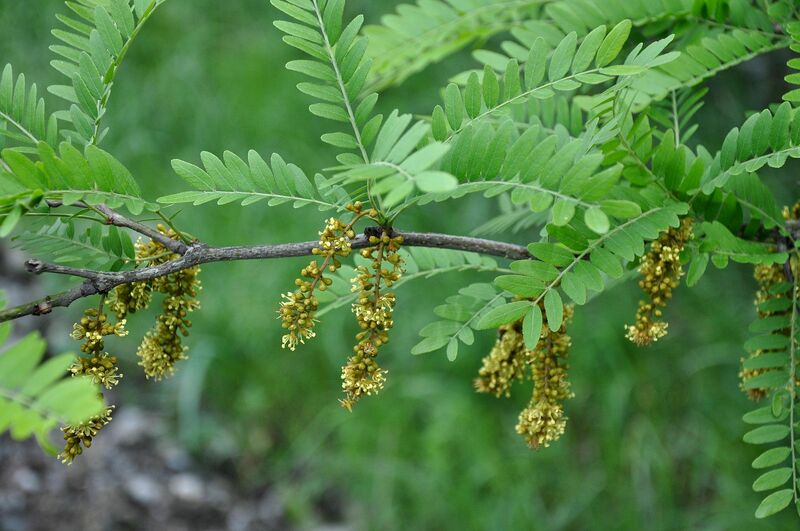 A beautiful and enduring small to medium shade tree, honey locusts have light, attractive leaves resembling ferns that turn a brilliant yellow in fall. Its leaves degrade quickly once fallen – something gardeners greatly value. Although they prefer moist and well-drained conditions, they are also drought resistant and tolerate a good amount of salinity. This means that they are well suited to D.C.’s marshy and humid environment and can tolerate the frequent use of road salt as well as adapting to the compact soil found along roads and sidewalks. Plant one of these tough guys in your yard through our residential planting program, RiverSmart Homes. You can also get up to $100 back for planting this tree yourself through our tree rebate program. While scattered or rare in the wild, the Kentucky Coffeetree thrives in urban environments thanks to its ability to transport easily and its touch nature. It got its name as the roasted seeds were once used as a coffee substitute but the raw seeds, however, are poisonous. The reddish-brown wood makes attractive cabinets, and the fruit pulp has been used in home remedies. You too can fill your yard with attractive, large, bluish-green leaves and greenish-white flowers that bloom in spring when you plant one through our residential planting program, RiverSmart Homes. You can also get up to $100 back for planting this tree yourself through our tree rebate program. The Japanese zelkova is a good street and shade tree that has an appealing vase-shaped form with a rounded crown. Green leaves turn yellow, copper, orange or deep red to purplish-red in fall, putting on a showy display. The peeling bark on older trees exposes orange patches, which can be quite impressive. As it is tolerant to drought and air pollution, this tree is a nice option for a variety of urban locations, including your yard! Plant one yourself and you can get up to $50 back for planting this tree yourself through our tree rebate program. Red maple is one of the best named of all trees, featuring something red in each of the seasons—buds in winter, flowers in spring, leafstalks in summer, and brilliant foliage in autumn. Its showy nature coupled with its tolerance of a multitude of soils, it’s no wonder it’s one of the most popular planted trees. This tree is available through our residential planting program, RiverSmart Homes. Since this will grow into a large shade tree, it’s eligible for up to $100 back for planting this tree yourself through our tree rebate program. Known as the swamp king of the South East, the bald cypress is a specialist species that knows exactly where it wants to be so it has evolved some interesting traits to thrive in wet and swampy conditions. The trunk of the bald cypress flares near the base such that some trees are more than twice as wide near the base as they are only a little further up. This makes for a very stable trunk that can withstand the rigors of flood events and waterlogged soils. Get yourself your very own Swamp King through our residential planting program, RiverSmart Homes or plant one yourself and receive up to $100 back through our tree rebate program. While the Bald Cypress may be the swamp king of the southeast, the River Birch is the definitely known as the Birch of the south. While most birches thrive in cold places, the River Birch is different. With a native range spreading from New England west to Minnesota and south to Texas and Florida, this is no pansy birch that withers at the site of a hot sun. Indeed, the river birch claims wet sites and the river’s edge as its stronghold but it is, in fact, a species able to succeed in a breadth of conditions. A key component of urban stormwater management, When planted as part of a “rain garden,” water can be channeled to the river birch, allowing it to thrive and putting it to work soaking up water. You can get your own river birch through our residential planting program, RiverSmart Homes or plant one yourself and receive up to $100 back through our tree rebate program.